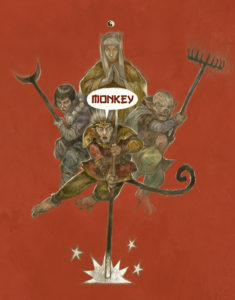 23 Days of Monkey, Day 5 Little Monkeys | Monkey Magic! 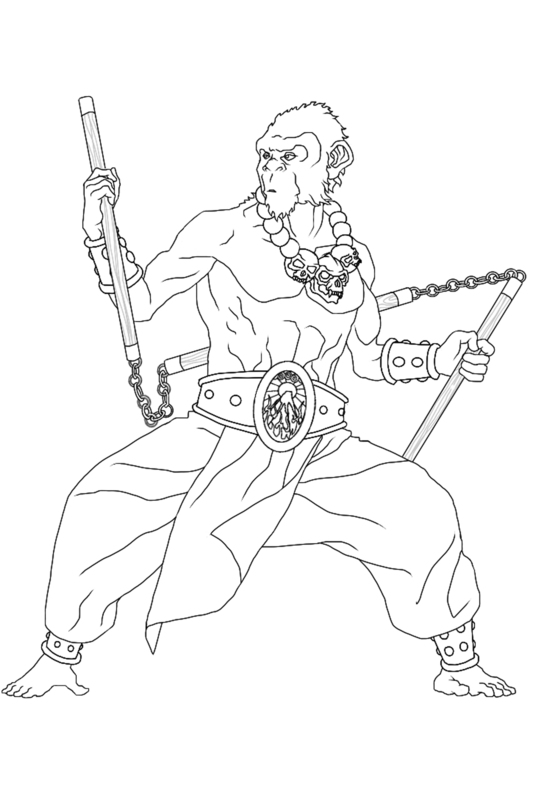 One of Monkey’s names is the Stone Monkey King of Water Cave Mountain*, since he’s the king of the mortal monkey troupe, that he meets shortly after his birth from the Cosmic Stone Egg which is infused with life giving forces by the elements, and leads them to live in this magical mountain. These are his Little Monkeys, that he rules benevolently until he decides to go travelling to find someone who can teach him the secrets of immortality in the human lands. After learning how to become immortal and achieving it under the guidance of a Taoist Sage, he returns to the Water Cave Mountain. In his absence a mighty Demon of Havoc has taken over his kingdom and enslaved or killed his Little Monkey subjects. Monkey with the aid of his newly learnt Taoist Magic quickly slays the Demon of Havoc and subdues his demon army, whose generals become his vassals. 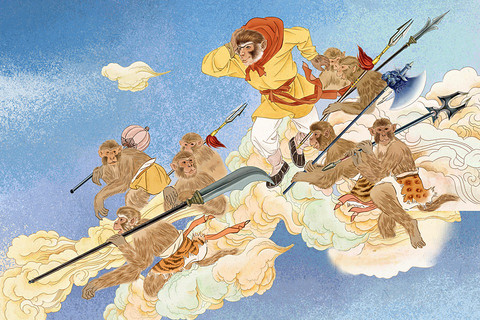 So that the Little Monkey’s can never be at risk of being conquered again he goes the court of the Eastern Dragon King of the Eastern Ocean and from his armory not only takes the his famous Iron Staff of the North Pole Star but also enough iron arms and armour for his Little Monkey’s and their Demon allies. The Little Monkeys in the book are both dependents that Monkey has to protect and care about, but also advisers and comforters. Its the Old Monkeys are the ones who suggest that their King find a Taoist Sage to teach him Immortality and they all console and comfort him when he gets fed up with the whole Journey to the West and abandons it for a while. 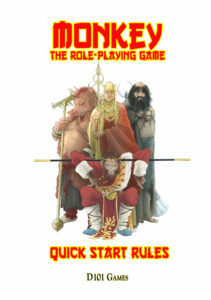 In game the Little Monkeys, and similar non-player character characters,model their role in the book as Dependents , who don’t necessarily go on the Journey to the West who can be called upon for help and are open to attack from enemies. 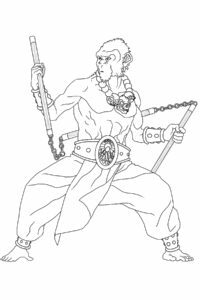 The Little Monkeys are also available as a character type in Defenders of the Dragon Empire, which is the wuxia adaptation of Monkey for Mortal Heroes which will be included in the book as a Stretch Goal and as a standalone game as a higher funding Stretch Goal. Here’s Brass Head a Little Monkey looking for his missing King. Earth Grounded He can draw upon the power of the Earth, to deflect and soak up damage, dispersing it in the ground beneath his feat. Limit: does not work if Brass Head is not touching the Earth. Necklace of Three Pilgrim’s Skulls. This talisman allows the possessor to summon the three ghosts bound within it; The Knowing one, The Angry One and the Foolish One. Walk among men as if he was one of them.The Monkey knows a minor charm that allows him to appear as a human being. Pre-Game: Student of the Monkey King at the Water Cave Mountain. 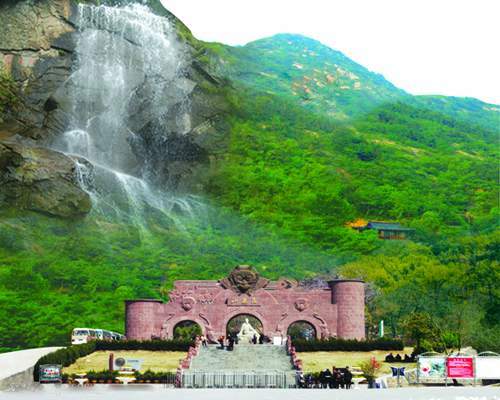 Notes * Water Cave Mountain has a physical presence in the real world in the form of Huaguo Mountain in Jiangsu province China. Day 5 of 23 Days of Monkey, Kickstarter in 18 days on 8th January 2017.